Home / UncategorizedLatest technologies for a Smart Bathroom!! Smart technology and automation is being integrated into many rooms throughout the home. Don’t let your bathroom get excluded. There are plenty of ways you can start to integrate smart technology and create a more comfortable bathroom for you and your family. Check out the list of high-tech features that can make your bathroom so luxurious …..
One of the biggest developments for the bathroom in recent time is the smart shower toilet – because why would you go to the effort of flushing the loo yourself when technology can do it for you? Primitive toilet paper is gone, as these toilets are said to give you the ultimate feeling of cleanliness with oscillating shower spray that can be set to personal requirements. An LED-illuminated digital interface allows you to set and save your shower preferences, from your perfect temperature to your ideal spray intensity, and activate it via remote control. 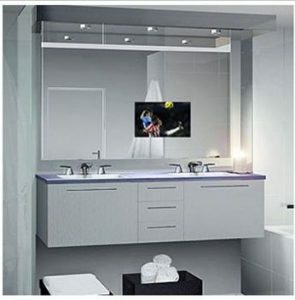 In this Vanity Mirror TV a screen is placed behind semi-transparent mirror. It looks just like a plain mirror when the screen is off and the screen is see when it’s on. Due to this disappearing feature it’s also called Magic Mirror TV often. You can also have storage behind mirror. 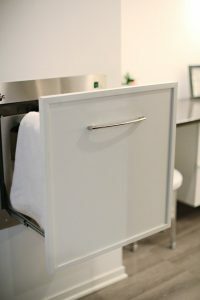 Installing a towel warmer is an easy, effective and affordable way to turn every shower into a luxurious spa experience. The towel drawer does a great job of evenly heating your towel, so that drying off after a shower or bath has never been so warm and cozy. Of all the rooms in the house, you require the most privacy when you’re in the bathroom. Of course, you probably still want your bathroom to have windows that let in natural light. 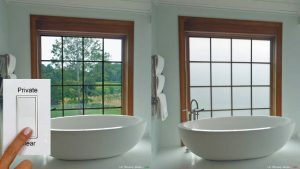 Installing bathroom window film on windows and glass doors allows you to make the glass transparent or opaque, using an app as the remote control. ← Give your entrance hall some ‘WOW’ factor ! !